$100.00 In stock - low quantity. Order in the next 12 hours, 8 minutes and it will go out today! In stock - low quantity. Order in the next 12 hours, 8 minutes and it will go out today! The Transforming Cube from Joker Magic is a wonderfully made giant die production device. One cube with endless possibilities. 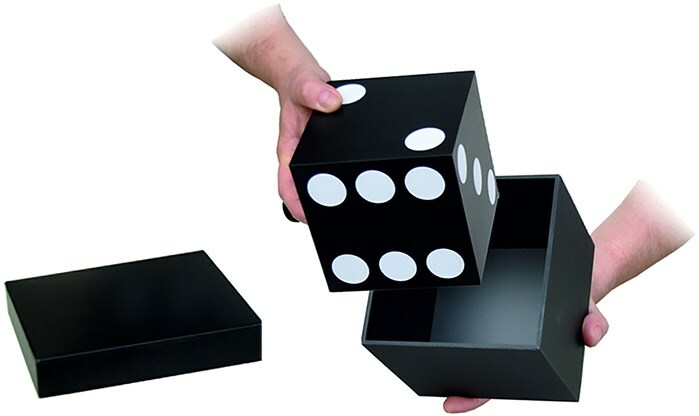 The giant die is placed into a black box and covered with a lid. A click of the fingers and when the lid is removed, items can be produced from the box, such as a rabbit, silks, sweets etc. The perfect prop for any children's party entertainer, as well as general magic performers. Please note: None of the production items, such as the rabbit, scarves and sweets are included.